Exuberant birds’ songs at all hours. Eggs, you find them everywhere around Easter time ! 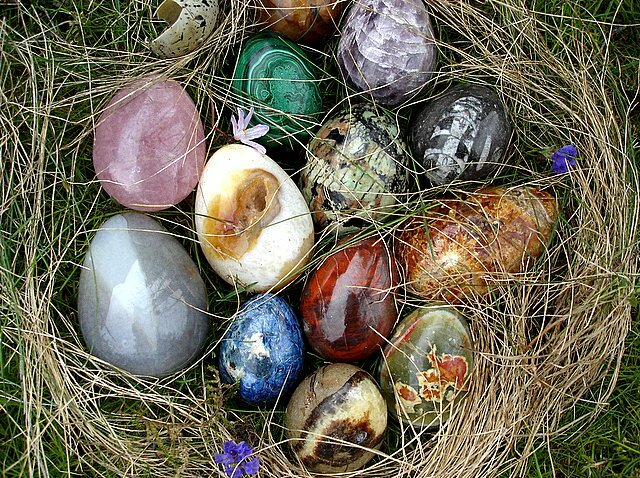 Mostly chocolate eggs over here 😉 Not all though; those are carved in various semiprecious stones from Madagascar. I got them as I lived in this great island and visited market places, craftsmen’ workshops. Almost every day during Easter time, I walked along a narrow irrigation canal (the local name is “bisse”). Sometimes on wooden paths or bridges, but mostly on mountain tracks barely freed from snow. 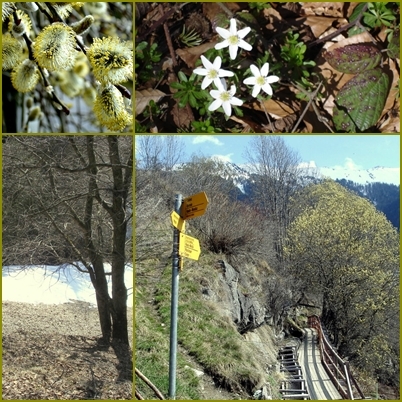 The very first flowers were blooming on the dry slopes. Delightful ! Sewing and reading, two of my favorite hobbies. The “grandmother flowers’ garden” is still growing and blooming… since it is sewed by hand, I like to bring it along wherever I travel and I added quite a few hexagonal flowers. Spring mood and also the wish to see this quilt finished at last. A low table has been waiting to be covered for… quite a while. 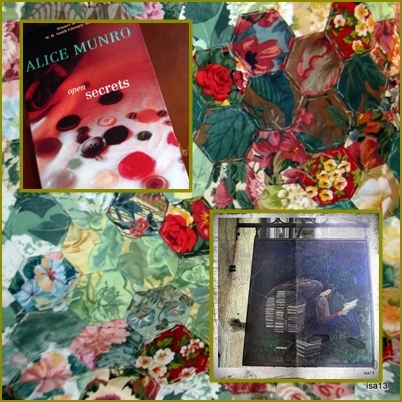 In my favourite second-hand bookstore I found a wonderful book by Alice Munro (Ontario, Canada): “Open Secrets”. Shorts stories about women that take place over several generations from 1850s to the present, from Canada to Australia, the Balkans and France. Unconventional women who never wanted to be contained. I so enjoyed each story! Alice Munr0’s writing is simply superb. Her characters never leave you. I already know that I will read more of her. How about you, what are you reading right now ?